Applying mulch to your soil is key to proper gardening. Mulch insulates your soil to protect plants from heat and cold, helps the soil retain moisture, and guards against weeds, among other benefits. That’s why knowing how to lay mulch is crucial for gardeners of any experience level. It’s also important to understand how to choose the best mulch for your garden. These tips will help. Whether you’re just starting to create your first garden, looking to sell your home, or you’re a seasoned pro looking to refresh some essential knowledge, keep them in mind to ensure your garden delivers the best possible results. We’re here to teach you what yard mulching is, when to mulch, and how to lay mulch. Mulching is the process of applying a layer of organic material on top of your garden’s soil. Mulch can come in many forms, including grass clippings, wood chips, and shredded leaves. It’s easy to create your own mulch when you have a lawn mower with mulching capabilities. There are certain factors worth keeping in mind when selecting the best mulch for your garden. For instance, different types of mulch have different appearances. You may want to select one at least partially based on its aesthetic qualities. If you’re proud of your beautiful garden, your mulch should contribute to its beauty. This is an instance when fresh organic mulch is superior to aged organic mulch. It won’t decompose as quickly, and will therefore retain its appearance. On the other hand, aged organic mulch is useful when you need an option that improves your soil quality. As it decomposes, it adds nutrients to the soil, helping your plants grow. Keep these points in mind when researching the best mulch for your garden’s needs. Remember, mulch insulates your soil. That’s why you shouldn’t apply it too early in the gardening season. You need to give your soil time to warm up. Start laying mulch too early, and you’ll slow down this process. Thus, the best time to apply mulch is typically mid-to-late spring. You might also need to apply a second layer in summer if your soil begins to dry out. Yard mulching can be a fairly major project depending on the size of your garden. Mulch is heavy, and you may want to have it delivered in bulk if you’re going to be filling a relatively large space. Consider this before purchasing your mulch. The last thing you want to do is lug multiple heavy bags of mulch from your car to your garden, exhausting yourself before you even get started on laying mulch. 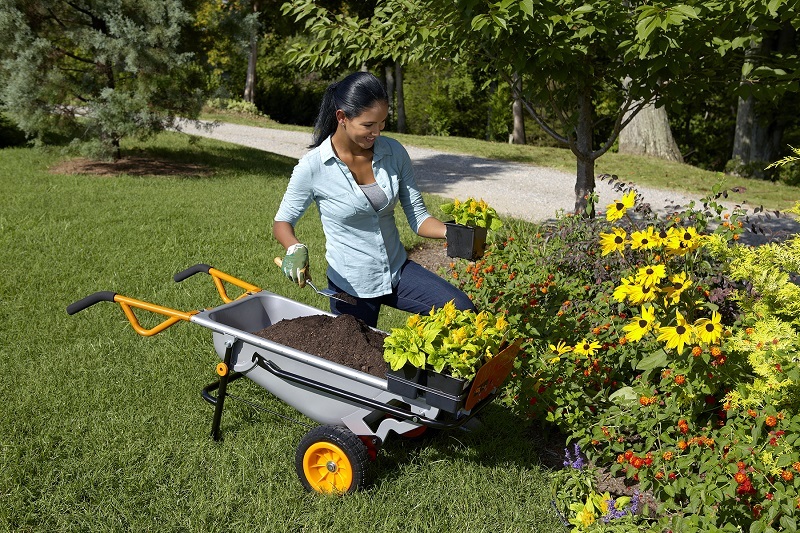 To transport the mulch to your garden, use a durable wheelbarrow. Dumping it from a wheelbarrow onto a bed is one of the simplest and most efficient ways to start laying mulch. Laying mulch in a small garden may not require special equipment. If you have a very small, flat space, you can spread the mulch evenly over your bed with a sturdy garden rake. Your goal is to thoroughly and evenly cover each bed. However, if your garden is large, or if it has difficult to access spots, it’s a very good idea to invest in a mulch blower. This piece of equipment helps you easily distribute mulch throughout a garden bed. That means you can save your energy for other garden tasks. Applying the right mulch at the right time and in the right way is key to starting a garden that will produce gorgeous results. Use the information here to ensure you learn how to lay mulch and choose the best mulch for your garden. As your garden begins to thrive, you’ll be glad you did. Find the tools you need to make laying mulch easier at WORX! What yard mulching is, when to mulch, and how to lay mulch.